Preheat the oven to 450° F. Place the cauliflower in a large mixing bowl. Drizzle the oil over and mix well. Combine the curry powder, cumin and sea salt. 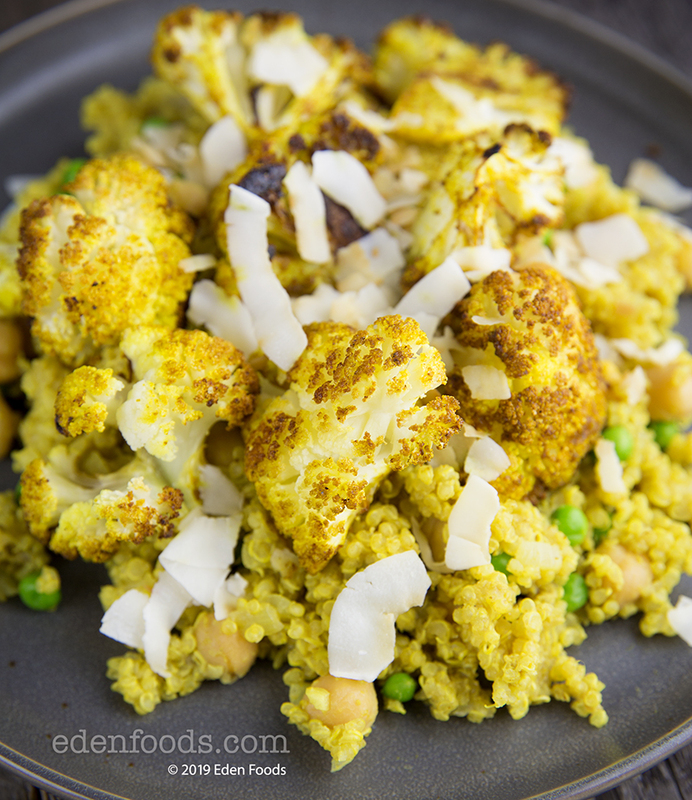 Sprinkle evenly over the cauliflower and toss to mix until the cauliflower is well coated with the spices. Arrange on a large baking sheet and bake about 1 hours or until tender. While the cauliflower is baking, prepare the quinoa. Heat 1 Tbsp olive oil and sauté the onion and garlic for 5 minutes until translucent. Add the quinoa and sauté another 5 minutes. Add the soymilk, garbanzo beans, curry powder and salt. Cover and bring to a boil. Reduce heat to medium-low and simmer about 20 minutes until the quinoa is light and fluffy. Add the peas and stir. Place in a serving dish. Remove the cauliflower and arrange in the serving bowl. Garnish with toasted coconut.